Historically, clinical symptoms associated with piriformis syndrome were thought to be caused by prolonged and/or excessive contraction of the piriformis muscle. As research began to focus on the role of joint kinematics, which are involved with the mechanics of pure joint motion without reference to the masses or forces involved, a better understanding of hip function and anatomy became available as part of the clinical evaluation. The secondary role hip kinematics plays in sciatic nerve mechanics also became better understood. Research in hip kinematics has identified a number of areas within the deep gluteal space where the sciatic nerve may be susceptible to entrapment. Although the designation piriformis syndrome is still used, these observations lead to the introduction of the term deep gluteal syndrome (DGS) which better distinguishes the pathophysiology and clinical symptoms of hip and buttocks pain as well as radicular pain caused by non-discogenic and extrapelvic entrapment of the sciatic nerve. Different disparate and unique orthopedic and neurologic disorders may result in nerve entrapments within the subgluteal space and are included within the definition of the DGS. Fibrous bands may compress pelvic neurogenic structures. The short lateral hip rotators including the piriformis, the obturator internus, the gemelli, and quadriceps femoris may also be involved in sciatic nerve entrapment. The gemelli-obturator internus syndrome can result in sciatic nerve entrapment from a stretched or anatomically abnormal obturator internus muscle, sometimes in combination with a fibrous band that entraps and constricts movement of the sciatic nerve.8 Both quadratus femoris and ischiofemoral syndrome are due to impingement of the ischium and femur, which results in abnormal contact between the lesser trochanter and the ischium; this condition is usually secondary to trauma or surgery. The narrowing of the space between the ischial tuberosity and femur causes hip pain and may also contribute to sciatic nerve entrapment. DGS may also include sciatic nerve entrapment resulting from abnormal hamstring pathology. The hamstring may be strained or sustain an injury such as a tendon detachment, avulsion, manifest apophysitis, or tendinopathy. This is sometimes referred to as the hamstring syndrome or the ischial tunnel syndrome and may also play a role in sciatic nerve entrapment during hip motion.9,10 It is not uncommon for patients to be given a diagnosis associated with lumbosacral spine pathology when the pain etiology is actually related to deep gluteal structures. 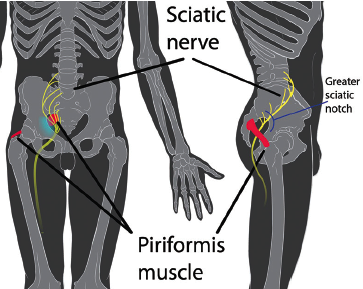 Although multiple physiologic and anatomic factors may contribute to the DGS, this brief discussion focuses on the relationship between the piriformis muscle and sciatic nerve, which represents the most common entrapment neuropathy in the subgluteal space. Figure 1. Sciatic notch anatomy. Created by Patrick J. Lynch & KDS4444. https://en.wikipedia.org/wiki/Piriformis_syndrome#/media/File:Piriformis_syndrome.jpg Reused with permission under CC BY-SA 2.5 (https://creativecommons.org/licenses/by-sa/2.5/). The piriformis muscle is a flat, band-like muscle located in the buttocks near the top of the hip joint. The muscle has its origin from the sacroiliac (SI) joint, bridges the SI joint, and connects to the greater trochanter of the femur (Figure 1). The piriformis is the only muscle that has a course which transverses through the greater sciatic notch. All structures from the greater sciatic notch pass above or below the piriformis muscle. The superior gluteal artery and superior gluteal nerve pass above the piriformis muscle. The sciatic nerve, pudendal nerve, nerve to the obturator internus, posterior cutaneous nerve of the thigh, inferior gluteal artery and nerve, and the nerve to the quadratus femoris pass below the piriformis. Piriformis muscle functions include stabilization of the hip joint during movement and is involved in lifting and rotating the thigh away from the body. The piriformis muscle rotates the joint and turns the leg and foot forward with gait, allowing us more efficient weight shifting from one foot to the other as well as maintaining balance. The piriformis muscle is involved in almost every motion of the hip and leg. Symptoms of sciatic nerve compression in the deep gluteal region are best defined as a mechanical anatomic variant rather than a pathophysiologic disease process (eg, primary neuropathy). Sciatic pain is usually a result of some type of anatomic lesion with secondary mechanical compression of the nerve or nerve roots. In the case of the DGS involving the piriformis, if sciatic pain is involved, it is most often because of an abnormality within the piriformis muscle, sometimes associated with a fibrous band that entraps the nerve and decreases sciatic nerve mobility. This can result in painful stretching of the nerve during normal hip and knee movement. Fibrous bands compressing the sciatic nerve have been described at the level of the greater sciatic notch extending down to the inferior border of the piriformis. Pathological hypertrophy of the piriformis results in asymmetric enlargement that may also compress the sciatic nerve.12 The variability in sciatic nerve position as it transverses the piriformis has been considered as a risk factor, but to date, no concrete evidence has documented that variances play a role in sciatic nerve entrapment. As was postulated in early descriptions of piriformis syndrome, prolonged or excessive contraction of the piriformis muscle may, over time, precipitate deep gluteal pain. If anatomic piriformis abnormalities involve the sciatic nerve, clinical symptoms may include extreme gluteal and low back pain. Pain of DGS is often exacerbated by activity associated with hip flexion, including walking, sitting, reclining, lifting, or even standing. Deep gluteal pain may be intermittent and paroxysmal or persistent and unrelenting. The degree of pain associated with DGS can limit activities and result in sleep deprivation. Pain is the dominant clinical presentation in patients with DGS and significant focal sensory findings or other major focal neurological abnormalities are uncommon. For example, demonstrable motor paresis (eg, foot drop) would be an unusual presenting symptom. Conversely, on physical examination there may be more subtle findings of atrophy and muscle weakness that may occur as a result of disuse and altered synergy in motor function, sometimes secondary to acquired gait abnormalities or as a result of the pain itself. Although there are clinical signs to help differentiate DGS from other conditions like lumbar spine disease, there is no one specific physical finding or anatomic abnormality that definitively diagnoses DGS. Symptoms of DGS are usually unilateral but can be bilateral. This may be due to the underlying etiology of the condition itself which is frequently related to anatomic abnormalities in the pelvis or hip joints. Anatomic changes affecting how the femoral head sits in the acetabulum, or other structural hip or pelvic abnormalities, may result in subtle gait disorders that affect the hip and subsequently pelvic biomechanics and structures. Over time these abnormalities can contribute to the pathologic changes and clinical signs and symptoms of DGS. For example, if there is femoral head and neck retroversion, it creates a condition in which the femoral neck and head in the acetabulum is rotated backwards on the femoral shaft. In susceptible individuals, this type of anatomic variant can result in hip pain and other long-term consequences. Anteversion is when the femoral head and neck angle is rotated anteriorly. This can result in increased range of hip motility but limited lateral rotation. In many people, these congenital anatomic variants may not result in clinical symptoms; in others, variant femoral positions could result in secondary conditions. Gait alterations may be associated with abnormal pelvic motility that may alter pelvic kinetics. The latter could contribute to the development of pathologic abnormalities and abnormal biomechanics within the deep gluteal fossa. In certain individuals, dynamic changes in normal function might be a precursor to the development of DGS. Although there are different etiologies of nondiscogenic sciatic nerve entrapment, large studies confirm that within the pelvis, the most common site of entrapment is beneath the piriformis (67.8%). The sciatic foramen is the second most common site of sciatic nerve entrapment (6%).13 A broad spectrum of precipitating factors for DGS has been described including acute trauma, iatrogenic inflammatory conditions, infectious diseases, vascular abnormalities, and gynecologic and other space occupying lesions. In patients with sciatic nerve symptoms, lumbosacral spine pathology and other intrapelvic lesions must also be ruled out. Historically, trauma is the most common etiology related to DGS. Although it has been postulated that individuals who run, bicycle, or do similar activities are more susceptible (especially if they do not routinely stretch and strengthen laterally before exercise), the evidence for this is insufficient and unsubstantiated. Although most would agree that acute trauma is a definite cause of DGS; dormant activities such as prolonged sitting without physical activity may also lead to DGS. An awareness of potential exogeneous causes of DGS, including hip anatomy, and biomechanics and pelvic kinetics as well as sciatic nerve anatomy are all important considerations in understanding the mechanics of DGS. This level of understanding distinguishes experts in diagnosis and treatment of DGS from the general orthopedic surgeon and general neurologist. Knowledge of all the contributing factors of DGS, focusing on the specific skills of the examination, utilizing appropriate imaging and diagnostic testing, and awareness of the different treatment options differentiates and defines those who are usually the most skilled in the diagnosis and treatment of nondiscogenic sciatic nerve pathology associated with the DGS. Understanding and recognition of anatomic relationships within the deep gluteal fossa, including the various sites where the sciatic nerve can be entrapped, continues to evolve. The physical examination for deep gluteal pain performed by experienced orthopedic surgeons and neurologists with expertise in DGS may include traditional maneuvers as well as evolving new clinical findings.7 Well-known tests including the Lasegue test; Pace’s sign; Freiberg’s sign; Beatty’s maneuver; the flexion, adduction, and internal rotation (FAIR) test; the Hughes test; and the piriformis sign may be helpful. Although electrophysiologic studies of the posterior tibial and peroneal nerve, including H reflexes, have been used, most experts agree that EMG and nerve conduction velocities are of limited value. Figure 2. MR neurography shows both an enlarged piriformis muscle and a compressed sciatic nerve on the right side. 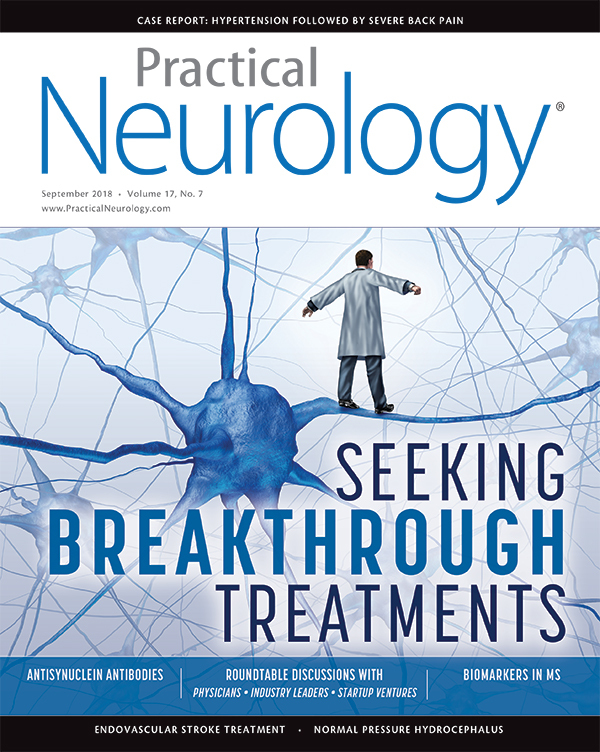 Reproduced with permission from The Neurography Institute. Imaging studies including CT, MRI, scintigraphy and ultrasound, are of value in identifying DGS. Detailed high-resolution pelvic imaging with 3-T MRI is now available and offers increased sensitivity and visualization of nervous tissue. There is increasing discussion among various experts that 3-T MRI has essentially changed their diagnostic capabilities by more accurately clinically confirming both normal anatomy and abnormal anatomy. Although other tests still have significant value and are often used in diagnosis and treatment of patients with DGS, 3-T MRI appears to provide a degree of precise imaging required to identify the underlying pathology. Magnetic resonance neurography is available, although considered by some insurance companies as investigational. High resolution 3-T MRI can detect the presence of sciatic nerve entrapment, irritation, and swelling within the sciatic nerve. 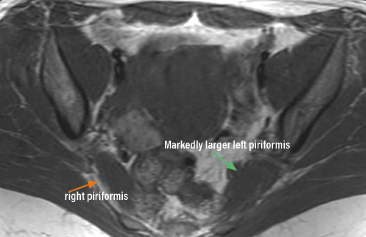 Compressive fibrous bands within the pelvis can also be detected with 3-T imaging. Hypertrophy and edema of the piriformis muscle and other structures is also clearly demonstrated. Neurography can determine whether a patient has a split sciatic nerve or a split piriformis (Figure 2). Although not all patients need or can tolerate 3-T MRI, for those who can, the resolution and information provided can be extremely helpful. Identifying the deep gluteal anatomy with specificity permits more accurate diagnosis that ultimately may translate into more treatment options, including surgery when indicated. The treatment for DGS varies according to the pathology. For most patients, even those with DGS associated with sciatic nerve entrapment, the desired treatment is conservative management including physical therapy, lifestyle modification when indicated, pharmocologic intervention with NSAIDS and possibly muscle relaxants, and the avoidance of recognized contributory activities. For patients with chronic DGS home therapy may be a life-long commitment. Physical therapy for patients with DGS will differ from physical therapy for those with lumbar spine disease. For this reason, it is optimal to have a physical therapist who is familiar with the nuances of the DGS working with a physician specializing in DGS. For patients who do not respond to conservative therapy or have intractable pain that limits daily activities and impairs their ability to function, imaging guided intra-articular and extra-articular injections may be helpful. Injections of an anesthetic with steroids directly into the piriformis muscle may be very beneficial. Fluoroscopy-guided contrast injection technique is limited because fluoroscopy does not allow optimal visualization of the soft tissue. Although ultrasound-guided injections are an effective, affordable, and preferred technique of many specialists, CT-guided injections directly into the piriformis have become increasingly popular when available.14 Botulinum toxin has been reported as an effective adjunct to physical therapy,15 and is being evaluated for potential benefits versus any potential short term and long term side effects. In patients with intractable and disabling symptoms for whom neither conservative therapy nor injections have been effective, endoscopic assessment and decompression surgery is another therapeutic option When performed by experienced surgeons, endoscopy enables a complete extrapelvic sciatic nerve visualization and decompression in the deep gluteal space. The different surgical techniques for decompression can be extremely complex and are best performed by experienced surgeons who are knowledgable about the deep gluteal space anatomy and have expertise in the pathology and the biomechanics of the deep gluteal space structures. In clinical practice, DGS remains an underdiagnosed condition. Symptoms are easily attributed to lumbosacral spine disease and sometimes hip pathology. Is it possible that some patients with chronic low back pain, radicular pain, gluteal pain, or failed spinal surgery actually have symptoms related to DGS with discomfort secondary to an entrapment neuropathy in the pelvis. Because pain from degenerative lumbar spine disease may overlap with the pain of DGS, can patients, or even experienced physicians, clinically distinguish between them? Since both degenerative lumbar spine disease and DGS may occur simultaneously with similar risk factors (eg, athletics, trauma, prolonged sitting, or aging), what are the patient’s distinguishing factors that differentiate the etiology of severe low back pain and radicular or gluteal pain on a clinical basis? The multifactorial etiology of DGS characterized by a group of associated symptoms that consistently occur together defines this condition as a syndrome. Although the diagnosis of piriformis syndrome as a cause of gluteal pain and potentially sciatic nerve involvement had been controversial, current imaging modalities, increasing knowledge of deep gluteal space anatomy and better understanding of the physiology of the deep gluteal space has allowed clinicians to make great strides in clinically identifying the clincal entity of deep gluteal syndrome. Cadaver studies of the deep gluteal space, the clinical history and physical examination, advanced neuroimaging including 3-T MRI, and endoscopic identification and corrective surgery of the clinical pathology within the deep gluteal space, more accurately define the clinical manifestations and pathophysiologic abnormalities within the deep gluteal space. The piriformis syndrome indeed does exist, but is only one potential component of the spectrum that defines DGS. In conclusion, DGS can cause pelvic neurogenic entrapment and should be included in the category of other more commonly recognized entrapment neuropathies. 1. Yoeman W. The relation of arthritis of the sacroiliac joint to sciatica, with analysis of 100 cases. Lancet. 1928;2:1119-1122. 2. Freiburg A, Vinkle T. Sciatica and the sacro-iliac joint. J Bone Joint Surg. 1934;16:126-36. 3. Thiele GH. Coccygodnia and pain in the superior gluteal region. JAMA. 1937;109:1271-1275. 4. Freiberg AH. Sciatic pain and its relief by operations on muscle and fascia. Arch Surg. 1937;34:337-350. 5. Freiberg AH. The fascial elements in associated low-back and sciatic pain. J Bone Joint Surg. 19412;23A:478-488. 6. Robinson DR. Pyriformis syndrome in relation to sciatic pain. Am J Surg. 1947;73:355-358. 7. Martin HD, Reddy M, Gomez-Hoyos J. Deep gluteal syndrome. J Hip Preserv Surg. 2015;2(2):99-107. 8. Kerr RM. Ischiofemoral Impingement Syndrome. MRI Web Clinic-October 2012. Radsource. http://radsource.us/ischiofemoral-impingement-syndrome. Published October 2012. Accessed August 12, 2018. 9. Gomez-Hoyos J, Reddy M, Martin HD. Dry endoscopic-assisted mini open approach with neuroimaging for chronic hamstring avulsions and ischial tunnel syndrome. Arthrosc Tech. 2015;4(3):e193-e199. 10. Lee S, Kim I, Lee SM, Lee J. Ischiofemoral impingement syndrome. Ann Rehabil Med. 2013;37(1): 143-146. 11. Jankovic, Danilo, Peng P, van Zundert A. Brief review: piriformis syndrome: etiology, diagnosis, and management. Can J Anaesth. 2013;60(10):1003-1012. 12. Carro LP, Hernondo MF, Cerezal L, et al. Deep gluteal space problems: piriformis syndrome, ischiofemoral impingement and sciatic nerve disease. Muscles Ligaments Tendons J. 2016;6(3):384-396. 13. Feller AG, Haynes J, Jordan SE, et. al. Sciatica of nondisc origin and piriformis syndrome: diagnosis by magnetic resonance neurography and interventional magnetic resonance imaging with outcome study of resulting treatment. J Neurosurg Spine. 2005;2:99-115. 14. Fishman LM, Dombi GW, Michaelson C, et. al. Piriformis syndrome: diagnosis, treatment, and outcome—a 10-year study. Arch. Phys. Med Rehabil. 2002:83:295-301. 15. Santamato A, Micello MF, Valeno G, et al. Ultrasound-guided injection of botulinum toxin type A for piriformis muscle syndrome: a case report and review of the literature. Toxins (Basel). 2015;7(8):3045-3956. Modified from an earlier version published in the Texas Neurologic Society’s newsletter, Broca’s Area, with permission.